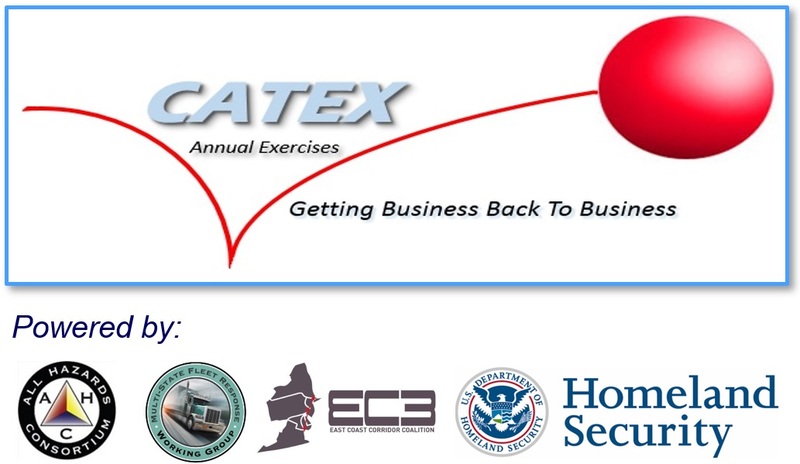 CATEX (Catastrophic Exercise) is a regional, email based multi-year exercise series being conducted by multiple states and private sector organizations that focuses on rapid restoration of power and supply-chain sectors following disasters in the Eastern U.S. and Canada. CATEX enhances public and private communications, coordination and sensitive information sharing for security and disaster response through process and technology improvements. CATEX creates opportunities for government and industry to create solutions to persistent operational coordination issues via process improvements and expedited sensitive operational information sharing during regional security/disaster incidents. During large, regional storms, disasters, or disruptions both industry and government operational decision makers need timely, “sometimes sensitive” information from reliable sources in order to make key operational decisions to effectively respond and recover quickly. Getting information from multiple states and sectors at the same time is very difficult during a regional incident. Decision makers need to see the big regional picture (e.g. reliable situational awareness to know “what is going on” and access to a “common operational picture” to know “who is doing what”). Government funded and operated information sharing systems are often not completely trusted, utilized or sustainable due to shifting government priorities, budget cuts, elections, and personnel turnover. Sharing information with government brings introduces potential risks to industry due to legal, regulatory, FOIA (Freedom of Information Act) requests, and competition. Industry requires control and more stringent legal, policy, process and technology protections in order to risk sharing “sensitive operational information” with government. According to the private sector and states, without this trusted regional sensitive information sharing framework, regional decision makers will only see pieces of the current situation and will not be able to properly coordinate response/recovery efforts. Lastly, exercising these processes and tools regularly determines how effective they become during disasters. The CATEX exercise series is designed bring industry and government together to periodically test sensitive operational information sharing procedures, processes, tools, roles and relationships to expose gaps and opportunities to improve information sharing across the enterprise of stakeholders. CATEX was formed out of FEMA’s Regional Catastrophic Planning Grant Program (RCPGP) in 2013 designed to promote regional planning and enhance public/private communication, coordination and information sharing for future large scale, multi-state disasters and/or security related incidents. CATEX produces “information sharing” based products (processes, tools, policy, etc..) designed to expedite information flow between multiple states and the life-line sectors (e.g. power, food, fuel, transportation, telecommunications, medical, etc..) in order to help communities, governments and businesses get back to business faster following natural, man-made or accidental disasters. CATEX focuses on producing information sharing based “exercise modules/drills”, designed by both public and private sector stakeholders that address their "sector specific operational choke points and issues" in their response efforts. These information sharing modules/drills, once tested, can then be integrated into future public and/or private sector exercises around the U.S.
﻿The All Hazards Consortium’s multi-state Fleet Response Working Group (FRWG) will conduct a four (4)-hour exercise DRILL that will focus on awareness and application of FRWG Disaster Response Tools & Processes in support of regional electric power restoration efforts across the Eastern United States and Canada. This exercise will be operational, not discussion-based. Participants will attend the exercise virtually. Information sharing will be limited to email exchange and web-based collaboration tools. Evaluate participant’s functional knowledge of AHC FRWG processes and tools. Stress test some key elements of the FRWG’s Regional Fleet Movement Coordination Initiative process and Sensitive Information Sharing Environment (SISE) information sharing tools to determine gaps. Education on the FRWG’s Fleet Movement Coordination with State’s process and tools. Description: Conduct a systematic process engaging the whole community as appropriate in the development of executable strategic, operational, and/or tactical-level approaches to meet defined objectives. Description: Establish and maintain a unified and coordinated operational structure and process that appropriately integrates all critical stakeholders and supports the execution of core capabilities. Description: Enable the recognition, understanding, communication of, and planning for risk and empower individuals and communities to make informed risk management decisions necessary to adapt to, withstand, and quickly recover from future incidents. Description: Assess risk and disaster resilience so that decision makers, responders, and community members can take informed action to reduce their entity's risk and increase their resilience. Description: Identify the threats and hazards that occur in the geographic area; determine the frequency and magnitude; and incorporate this into analysis and planning processes so as to clearly understand the needs of a community or entity. Predicted but isolated severe weather in the mid-west turns into a regional, widespread severe storm with little to no advance notice. The storm is projected to pass over States in the Mid-Atlantic and Northeast regions during a period of excessive heat, high temperatures, and high electrical load periods. Description: Provide transportation (including infrastructure access and accessible transportation services) for response priority objectives, including the evacuation of people and animals, and the delivery of vital response personnel, equipment, and services into the affected areas. Description: Deliver essential commodities, equipment, and services in support of impacted communities and survivors, to include emergency power and fuel support, as well as the coordination of access to community staples. Synchronize logistics capabilities and enable the restoration of impacted supply chains. Description: Ensure the capacity for timely communications in support of security, situational awareness, and operations by any and all means available, among and between affected communities in the impact area and all response forces.